The Stoves SGB900PS gas double oven can be built into your kitchen nicely. Its sharp black look blends well with most colours and with 8 shelf positions, it is perfect if you are looking for a lot of space. The top cavity is also conventional gas oven but contains 1 shelf and 2 shelf positions which is great if you need some extra space. It also has an electric grill, ideal for if you want an alternative cooking method. The main oven 69 litre cavity is also a conventional gas oven and has a rear halogen flood light which will enable you to see what is going on in your oven through the viewing window so you can check your food isn't overcooking. The main oven door is designed with a fascia cooling system which will keep the exterior cool to touch to prevent burns. This is particularly useful if you have small children in the house. 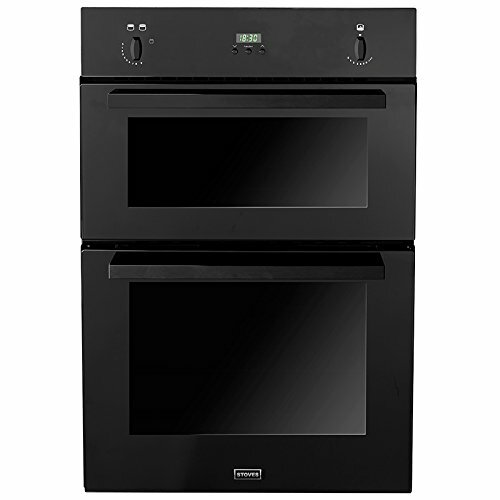 The Stoves SGB900PS Gas Double Oven is ideal if you are looking for a good all rounder and you need plenty of space.